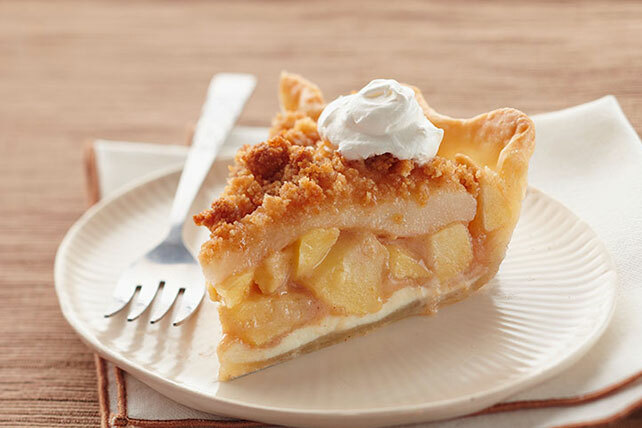 Try one of our longest-running hits with rave reviews: an Apple-Pear Crumble Pie! See what all the fuss is about with our five-star Apple-Pear Crumble Pie. Mix wafer crumbs, brown sugar and butter until blended. Place pie crust in 9-inch pie plate sprayed with cooking spray. Spread cream cheese carefully onto bottom of crust; sprinkle with half the crumb mixture. Combine fruit in large bowl. Add granulated sugar, flour and cinnamon; toss to coat. Spoon over crumb layer in crust; sprinkle with remaining crumb mixture. Bake 35 min. or until fruit is tender and crust is lightly browned, covering loosely with foil after 25 min. if necessary to prevent crust from overbrowning. Cool. You'll know it is a special occasion when the aroma from this special treat fills the house. Varieties of baking apples include Golden Delicious, McIntosh, or Granny Smith.